eD@HoMe: A lovely cover from Malta! For those of you who are not familiar with Malta... here is a brief description of this lovely country. Malta, a country composed of three major islands with a population of 402,000, is located in the Mediterranean Sea, just 93kms south of Sicily, Italy. Once part of the Roman Empire, it was seized and controlled by many factions over the centuries, including Napoleon. Malta's valuable military position was coveted by many, and it 1814, it became a British colony. That British control ended in 1964, as Malta gained its independence. With sparse areas of fertile land, its shipping and port facilities are economically important, but it's tourism that provides the major financial impact. 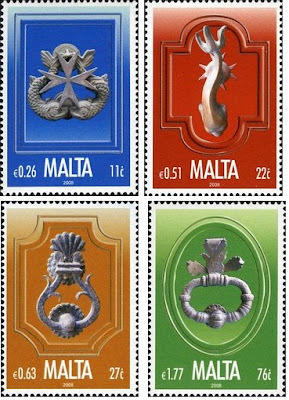 The beautiful stamp franked on this cover belongs to the "Il-Habbata (Door knocker)" series, issued on 5th March 2008. 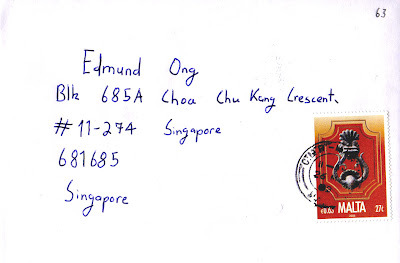 This cover took 6 days to travel an estimated distance of 9,873kms from Sliema, Malta to Singapore.